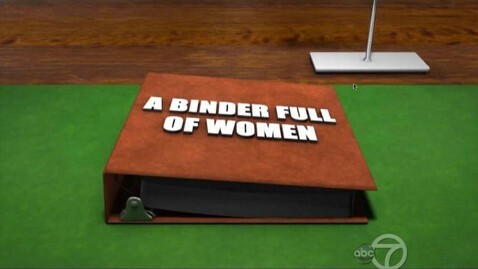 I'll take "A Binder Full of Women" for $600, Alex. That was the actual category on the Jeopardy! board on Monday evening as the game show resurrected one of the most memorable meme's of the 2012 election cycle: Republican Presidential nominee, Mitt Romney's comment made during the presidential debate against President Barack Obama at Hofstra University. Romney's inadvertently funny description came in response to a question from the audience in the townhall style debate at Hofstra about pay equity for women. The candidate was explaining that as the governor of Massachusetts searching for qualified women to fill cabinet posts, women's groups brought him "binders full of women" who were good candidates. "And I said, 'Well, gosh, can't we - can't we find some - some women that are also qualified?" Romney said. "I went to a number of women's groups and said, 'Can you help us find folks,' and they brought us whole binders full of women." The Internet went crazy for the term, which took on a life of its own. Read more about that HERE. This week Jeopardy displayed a graphic of a binder full of women as a topic choice. Jeopardy's "A Binder Full of Women" category included Supreme Court Justice Sotomayor, German Chancellor Angela Merkel and 1976 Summer Olympics gold medalist, Nadia Comaneci among others. Other categories on Monday's show included: "Hugo Awards For Science Fiction", "1990's Music", "World Place Names, "A Bunch of Stuff" and fittingly, "Funny Things People Say".